MagicScore Software announces the release of Virtual Piano, a free music composing tool to help enthusiasts compose music, type lyrics and print scores. The virtual piano keyboard is perfect for kids and adults to help develop creativity and music abilities, enjoy music improvisations and entertain family and friends. Designed to help music enthusiasts to improvise and compose music, type lyrics and print scores without paying a dime, MagicScore Virtual Piano costs nothing to the end user. The new tool provides an easy entrance into the world of music improvisations, offering hours of fun with piano music. MagicScore Virtual Piano helps kids and adults develop creativity and music abilities by delivering a virtual piano keyboard free of charge. Used as a family education and entertainment tool, MagicScore Virtual Piano helps amateur musicians become composers by allowing improvisations to be stored, edited and played back at a later time. The tool helps picking out the notes or adding lyrics to compositions. MagicScore Virtual Piano turns the PC into a complete virtual piano, allowing entering notes with a mouse or typing them with PC keyboard. The free virtual piano keyboard offers all the basics that are required to compose music, play back using a variety of timbers, type and print music, and save work into project files that can be used with the entire range of MagicScore notation products. The product offers a range of functions designed to share compositions with others by either emailing music or publishing notes. 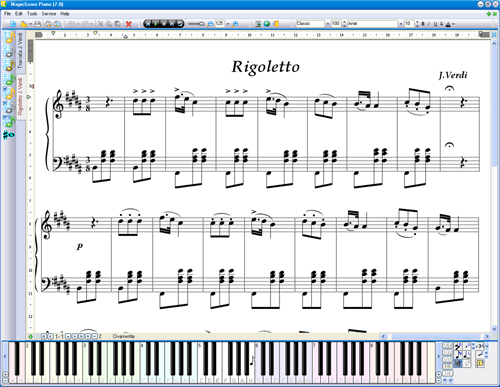 The built-in MagicScore Online plugin allows publishing your compositions on Web sites by embedding live playable and printable scores into the Web page. MagicScore Virtual Piano is great for kids and adults, offering the easiest work and the simplest learning curve. Fit for music enthusiasts and parents teaching the kids music, the free virtual piano keyboard can be just a perfect tool for anyone. MagicScore Virtual Piano offers a straightforward upgrade path to those outgrowing the free product. Those demanding more powerful features, playing a different musical instrument, or needing a higher level of customization are provided with a wide range of tools for typing, editing, playing or recognizing scanned sheet music, saving music notation files or MIDI sequences. 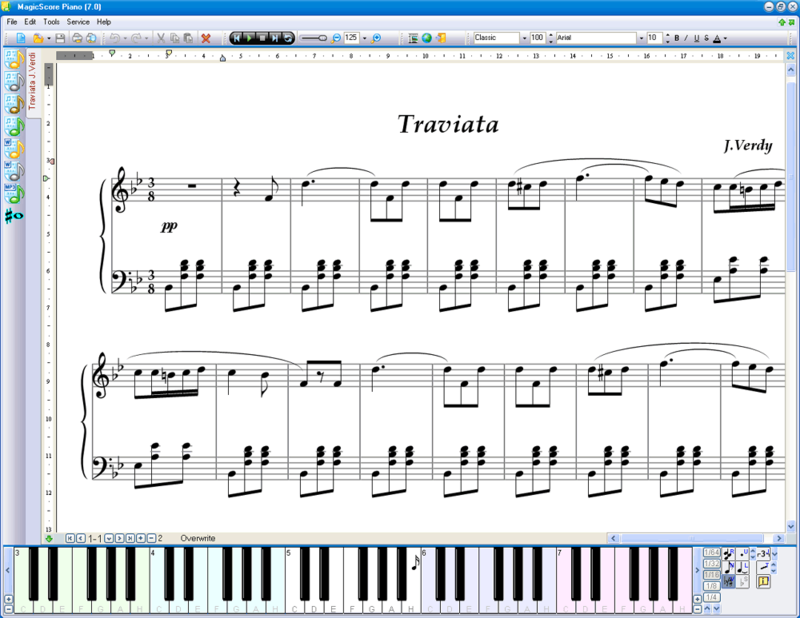 Certain MagicScore products enable typing notes and composing music in Microsoft Word directly. Founded in 1998, MagicScore Software offers a wide range of tools for composing and playing music, editing and printing scores, and recognizing sheet music to musicians and music enthusiasts worldwide. The company is committed to providing its customers with the best price/quality ratio possible, offering enthusiast features for amateur money. 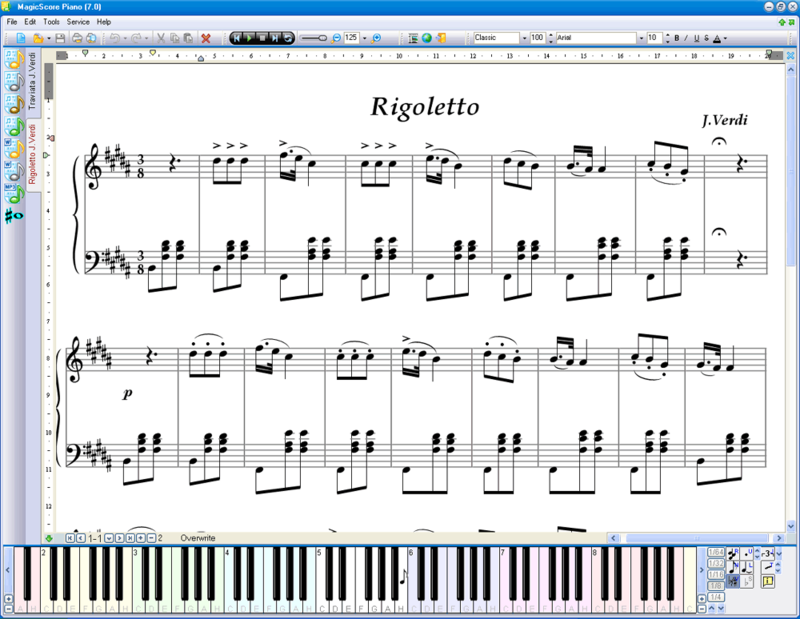 More information about MagicScore Virtual Piano and the free download are available at MagicScore Virtual Piano page. Link to MagicScore Virtual Piano press release.